Because adders are reptiles, they are cold-blooded. This means that they are reliant on external energy sources – especially the sun – to maintain their body temperature. They regulate their temperature through basking in the sun or seeking shade. Their body temperature is, therefore, approximately the same as the outside air temperature (ambient temperature). They can, however, be active in temperatures as cold as 6°C. 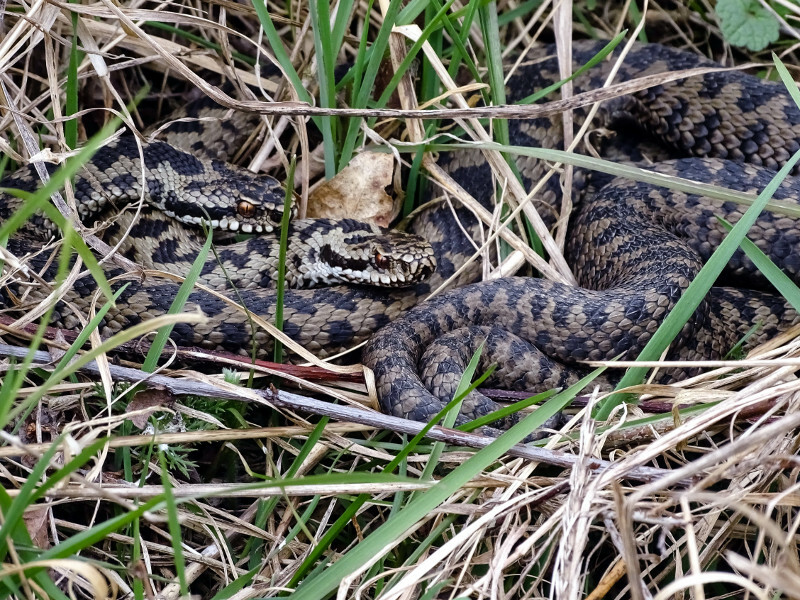 Which was about the temperature yesterday when I saw these two basking adders coiled together at Branton Nature Conservation Area, close to the car park entrance. Adders typically need dense ground cover. They need to be able to hide from predators (mostly birds) and also to find sunny spots for basking. With sufficient shady spots for cooling down, south-facing slopes can be ideal. 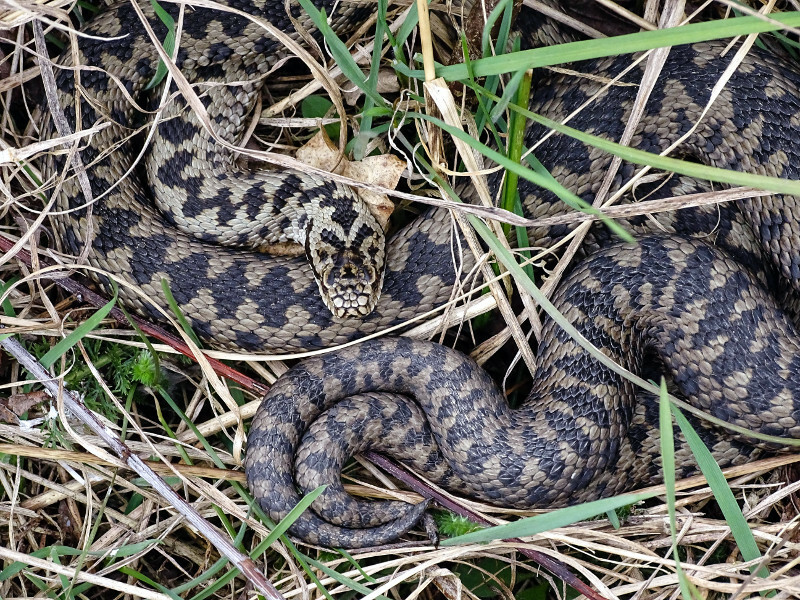 Now is a good time to go adder spotting, as they are coming out of hibernation. 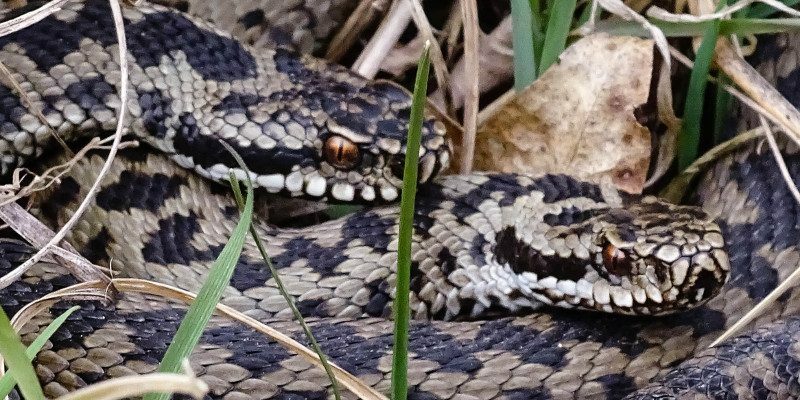 The air temperature is also still relatively cool and so the adders will have to spend more time basking in order to warm up. Adders have a distinctive dark zigzag running down the length of the back. There is typically a ‘V’ or ‘X’ shaped mark on the head, with a row of dark spots on each side. Males: usually grey with a black zigzag. Females: typically light brown with a dark brown zigzag. Exceptions: some can be completely black and can, therefore, be mistaken for other species.